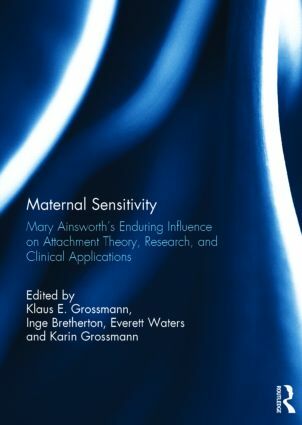 Mary Ainsworth’s work on the importance of maternal sensitivity for the development of infant attachment security is widely recognized as one of the most revolutionary and influential contributions to developmental psychology in the 20th century. Her longitudinal studies of naturalistic mother-infant interactions in Uganda and Baltimore played a pivotal role in the formulation and acceptance of attachment theory as a new paradigm with implications for developmental, personality, social, and clinical psychology. The chapters in this volume collectively reveal not only the origins and depth of her conceptualizations and the originality of her assessment methods, but also the many different ways in which her ideas about maternal sensitivity continue to inspire innovative research and clinical applications in Western and non-Western cultures. The contributors are leading attachment researchers, including some of Mary Ainsworth’s most influential students and colleagues, who have taken time to step back from their day to day research and reflect on the significance of the work she initiated and the challenges inherent in assessing parental sensitivity during naturalistic interactions in infancy and beyond. This volume makes Ainsworth’s pioneering conceptual and methodological breakthroughs and their continuing research and clinical impact accessible to theorists, researchers and mental health specialists. This book was originally published as a special issue of Attachment & Human Development. Klaus Grossmann, Ph.D., is Professor Emeritus in the Department of Psychology at the University of Regensburg, Germany. Inge Bretherton, Ph.D., is Professor Emerita in the Department of Human Development and Family Studies at the University of Wisconsin-Madison, USA. Everett Waters, Ph.D., is Professor in the Department of Psychology at the State University of New York at Stony Brook, USA..
Karin Grossmann, Ph.D., is a Senior Research Scientist (retired) in the Department of Psychology at the University of Regensburg, Germany.